Anyone who has ever wanted to call an Art of Hosting training has, in all likelihood, been told how important it is to have seasoned hosts – or stewards – as part of the hosting team. What does it mean to steward and why is this role so important in the Art of Hosting community and in individual training offerings? I wanted to ground the word steward with a definition but none of the ones I found resonated until I came across this on Wikipedia: it is desirable to increase capacity within an organizational system. The Art of Hosting is a system – an interconnected, self-organizing global network – and since it began almost two decades ago, it has been increasing capacity in the network, within and across organizations, within and across systems and within and across individuals. Even before there was such a thing as the name Art of Hosting, conversations were being hosted in many places around the world using different dialogic processes, including World Cafe, Open Space Technology, Circle Practice, Appreciative Inquiry (and still are being hosted by people who have not heard of the Art of Hosting). 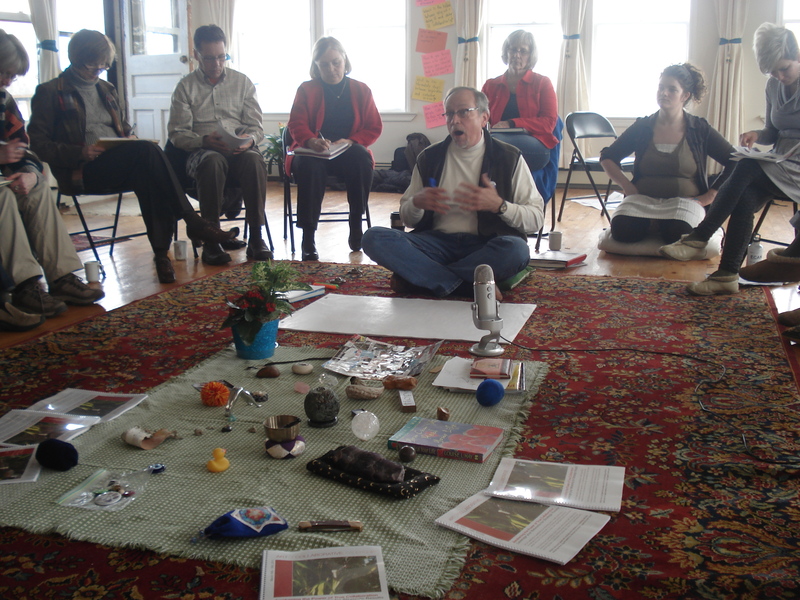 Those who have become known as Art of Hosting Practitioners were intuitively and intentionally sensing into questions like: what is underneath this process, what are the patterns we can make visible, why do these processes or this way of convening a meeting produce different results? They were deeply curious about the answers to these questions and the more evocative questions that were often provoked through the conversations stimulated by these questions. Stewards sense and hold the deeper patterns in the field. They don’t just hold this particular piece of client work or this particular training, they sense the patterns of the larger field and bring those patterns into the specific work and conversations they are involved in. They have skill, wisdom and expertise in holding space, creating the conditions for powerful work (setting the container) and in working with emergence by paying attention to what is wanting and ready to happen in an individual, group, organization, or community or with a pattern. They practice self-leadership or self-hosting and bring with them a presence often forged through the many fires of chaos, disruption and intensity they have found their way through which often enables them to keep their centre or ground in the most challenging of situations. They have no need to hold centre stage although they find themselves there because of their willingness to share knowledge and learning while hosting fields where people are hungry to learn. They bring clarity without doing the work of others or disempowering them or disconnecting them from their own sources of clarity, wisdom and knowledge. They witness growth and ignite even more growth – within themselves and others. They are flexible and diverse, growing the depth of field through co-learning with others. It is precisely this co-learning, co-creating and collaborating on the edges of what they do not know that makes them most excited – more so than presenting their expertise. My awareness of stewarding has heightened over the last year or so as I have found myself in many stewarding conversations with good friends in the Art of Hosting, World Cafe and Circle Practice networks (most recently at ALIA in Columbus) and as I have the privilege to co-host with other seasoned practitioners in a variety of situations where the ability to draw on accumulated wisdom and knowledge has been powerfully beneficial to other hosting team members including apprentices hungry to learn as well as the full group involved in the training. What do I know through some of my experiences? Stewards are able to check perceptions with each other to sense more fully into the field in which they are working, arriving at more informed choices of action, often to surface tension, move through groan zones, understand when divergence or convergence or some other intervention or process is needed. They are comfortable with silence and with chaos, have no need to rush in and they can weave with each other through and across the field. This does not mean there is never any tension but it does mean they have the capacity to work it through without detrimentally impacting the group or the overall experience. In how they work together, they are often living, breathing examples of the beauty and power of co-creation. I have had the opportunity to work more extensively with youth in the last year – in Canada, the US and Brazil – and see how sharing experience, asking good questions and holding space expands the depth of field in any given place and creates the opportunity for individual and collective expansion – by holding the space of curiosity with the space of experience. In One Art of Hosting Does Not A Practitioner Make, I wrote that each Art of Hosting has its own flavour influenced by the hosting team, the calling questions, the people who show up, whatever is emergent in the field, whatever we choose to call the training and the place in which it is hosted. It’s like seeing only a slice of the bigger picture. One reason why stewards are necessary to these trainings is that they carry with them the depth of the patterns from across many trainings and client consulting work and they can help illuminate these patterns and this depth through how they hold the space and the questions they ask. In any given training we will often say it is not about the methodologies – although when we use them we want to use them well. It is about the purpose and intention of what we are about, what we want to achieve and how to create the conditions to meet purpose and intention and make more things possible. Stewards illuminate the connections between people, places, trainings, theories, processes and patterns. They bring the weave of the whole network into the space and disturb the training ground in subtle and overt ways, based on the imprints of their many experiences, helping shift the shape of the experience, enabling individuals to shift their own shape and ultimately influencing the shifting shape of the world. This work is not for the feint of heart or lone wolves. It is for those who are willing to show up more fully in the relational field, ask for help when they need it, offer what they can and sink into their own learning. Stewards want to learn from each other and the more we work with each other, the deeper the relational field, the deeper the friendships and the richer the space we hold for others.